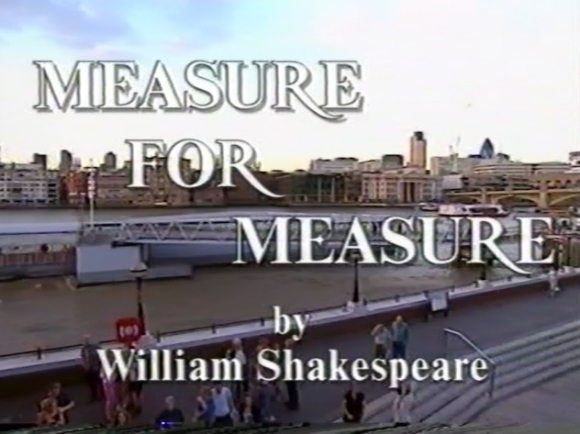 Shakespeare's Measure for Measure was given a live broadcast from the reconstructed Globe Theatre, with a cast including Mark Rylance (the Duke), Sophie Thompson (Isabella), Liam Brennan (Angelo), Michael Bertenshaw (Escalus), Alex Hassell (Claudio) and Colin Hurley (Lucio). Screened close to the 400th anniversary of the play's first performance, John Dove's stage production sought to recreate the feel of an authentic Elizabethan stage treatment, which was further enhanced by an optional onscreen context-setting commentary by Shakespeare expert Professor Kiernan Ryan for those with the appropriate digital technology. Those who lacked a red button were offered an accompanying discussion presented by the BBC's then political editor Andrew Marr with contributions from Dove, actress Juliet Stevenson and historian David Starkey.